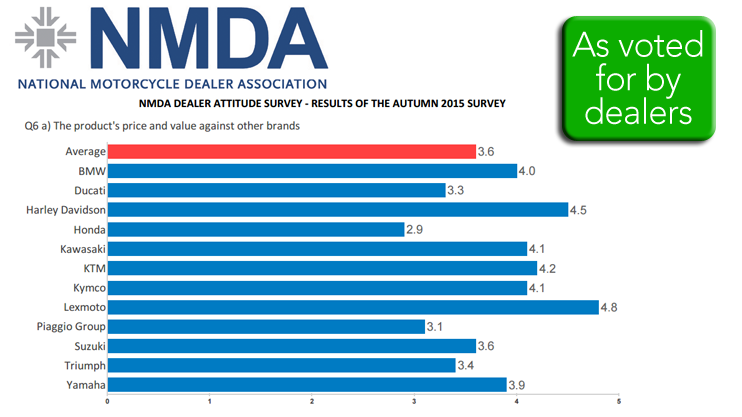 The National Motorcycle Dealer Association is an independent trade body that represents motorcycle dealerships across the UK. Because it is not accountable to manufacturers it allows dealers the opportunity for dealers to share exactly what they think about the manufacturers that they deal with. Twice a year the NMDA invites it's members to give feedback about the brands that they deal with. This allows an insight into exactly what it's like to work with the brand in question. Lexmoto received fantastic feedback in the Autumn 2015 survey and were votes as the top brand for Values whilst also placing highly in many other categories. Rather than keep this information to ourselves and dealers we believe that you our customers should be able to see exactly what the dealerships think about the various different brands.